In a first, scientists with the Institute for Molecular Engineering at the University of Chicago and Argonne National Laboratory have built a mechanical system—a tiny "echo chamber" for sound waves—that can be controlled at the quantum level, by connecting it to quantum circuits. Published Nov. 21 in Nature, the breakthrough could extend the reach of quantum technology to new quantum sensors, communication and memory. 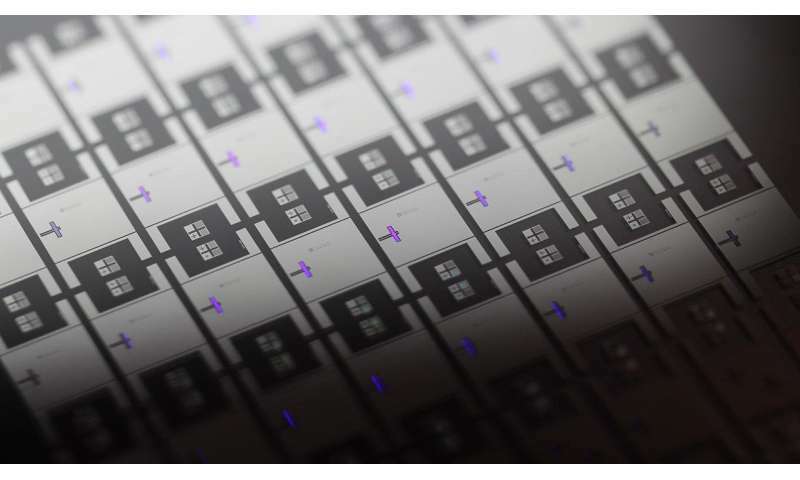 "Getting these two technologies to talk to one another is a key first step for all kinds of quantum applications," said lead study author Andrew Cleland, the John A. MacLean Sr. Professor for Molecular Engineering Innovation and Enterprise and a senior scientist at Argonne National Laboratory. "With this approach, we've achieved quantum control over a mechanical system at a level well beyond what's been done before." In particular, Cleland said, there's been much interest in integrating quantum and mechanical systems in order to make incredibly precise quantum sensors that could detect the tiniest of vibrations or interact with individual atoms. Cleland's research focuses in part on quantum electrical circuits, and he wanted to hook up one of these circuits to a device that generates surface acoustic waves—tiny sound waves that run along the surface of a block of solid material, like ripples moving across the surface of a pond. This phenomenon plays a key role in everyday devices like cell phones, garage door openers and radio receivers. "This particular result opens the door to be able to do a lot of things with sound that you can already do with light," Cleland said. "Sound moves 100,000 times slower than light, which gives you more time to do things. For instance, if you're storing quantum information in a memory, it can last a lot longer stored in sound than in light." The technique also could point the way toward a quantum "translator" that would allow quantum communication across any distance. The electronic atoms Cleland's group works with can only operate and communicate at very low temperatures; quantum acoustics could allow these circuits to convert quantum information to optical signals that could then be communicated over large distances at room temperature. It's possible an acoustic-wave setup could form the basis for such a system, known as a quantum repeater, Cleland said. The first author was Kevin Satzinger, Ph.D.'18, now with Google. Coauthors on the paper included Assoc. Prof. David Schuster and Prof. David Awschalom, as well as postdoctoral researchers Audrey Bienfait and Etienne Dumur; graduate students Youpeng Zhong, Hung-Shen Chang, Greg Peairs, Ming-Han Chou, Joel Grebel, Rhys Povey and Sam Whiteley; and undergraduates Ben November and Ivan Gutierrez (both AB'18). The problem is that all of this modern technology will be diverted towads Military by Various Governments. I have no idea what this article is describing. A sound "wave" is just the displacement of physical objects, usually meaning atmospheric molecules. I wouldn't think particles at the quantum scales would behave any differently because of the reason they were being displaced was due to sound as opposed to any other kind of physical force. Quantum information is usually exchanged/transferred via EM waves- photons. They do it with sound waves in a solid. The problem is that all of this modern technology will be diverted towards Military by Various Governments. The problem is the determinism of technology may halt as not all scientific/engineering ideas are scalable. Do we run in circles by our own eliminativism or are some ideals but imagination that must face a world of recalcitrance and tractabilities? The so called "standard model of physics" excludes quantum sound waves (longitudinal spin zero 'scalar field' waves do NOT exist in vacuum). However, this exclusion is artificial, based on many unproven or even disproved assumptions about nature. A sound "wave" is just the displacement of physical objects, usually meaning atmospheric molecules. The quanta in this context is the "phonon." Phonons are the collective mechanical excitations in elastic media. Longer wave phonons comprise "sound." Phonons are difficult to understand because they are not "particles" as we ordinarily conceive them. Instead they are best visualized as distortions in crystal lattices. The thing is, they can be created by absorption of a particle, usually a photon, at the incoming side, and be emitted as a photon from the outgoing side.